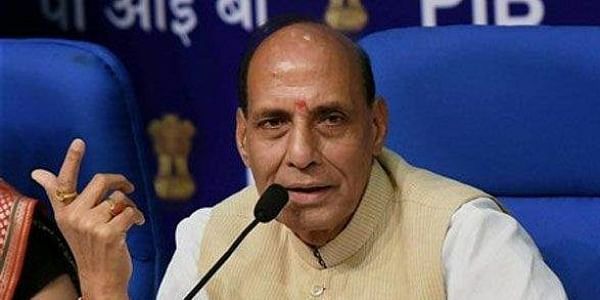 Hitting out at Gandhi over his "a question a day" social media campaign, Rajnath Singh said he should first tell why India remained poor despite the Congress ruling it for 50-55 years. SANAND: Home Minister Rajnath Singh today said the BJP formed government at the Centre because of the Gujarat model of development and that the people of the country had already answered the questions of Rahul Gandhi by giving it a mandate in the 2014 Lok Sabha polls. Hitting out at Gandhi over his "a question a day" social media campaign, Singh said he should first tell why India remained poor despite the Congress ruling it for 50-55 years. At a public rally here, Singh said, "The Congress leader (Rahul) asks what did the BJP government do in 22 years of its rule? What the BJP government has done in 22 years has been answered by the people of India during the 2014 Lok Sabha elections." "If development has gone mad here, then why the Rajiv Gandhi Foundation appreciated the Gujarat government in 2012. It was the Gujarat model because of which the BJP formed government at the Centre. "A single party ruled for 50-55 years... what is the reason India is still counted among poor countries in the world?" Rajnath asked. The home minister also suggested the three young leaders in the state who have supported the Congress -- Alpesh Thakor, Hardik Patel and Jignesh Mevani -- to stay away from Gandhi. "I would like to send a message to them that Rahul Gandhi will take them along when he sinks," he said, citing the example of Uttar Pradesh where the Samajawadi Party, which stitched a pre-poll alliance with the Congress, was defeated. Singh praised Prime Minister Narendra Modi, saying that because of him India had found a place of respect in the world community and that his government was committed to making it the most powerful country in the world. He said his government was committed to increasing farmers' income by 2022 and that the concerns of peasants in Sanand will be resolved as soon as the BJP returns to power in Gujarat. He also suggested the opposition to restrain itself while speaking about the prime minister.